April 19, 2014, Manila, Philippines - Summer gets even hotter in the metro as market leading budget mobile device maker DTC brings lofty discounts of up to 30 percent on selected Android-based smart devices fished off DTC’s fourth wave series. Slated to happen on April 22 to 30, DTC’s Summer Inventory Sale will take place in the (state specific place in Market! Market!) of Market! Market! in Taguig City and will be featuring three of DTC’s top-selling smart phones- the GT6 Astroid Jack, the 4.6-inch GT8 Bit and 5-inch GT9 Pump - and DTC’s first phablet, the GT10 Bullet. With the sale in place, customers will enjoy discounts from P791 to P2,000 per unit. For instance, the 6-inch GT10 will be available for only P4,999 from a previous SRP of P6,999. Customers can purchase the GT9 for only P2,999 (originally P4,490) and the GT8 for only P3,990 (originally P4990). Save for the GT6 Astroid Jack, all DTC units on sale pack a 1.2 GHz dual core processor plus 512 MB of RAM for speedy and heavy-duty usage. They also ship with the latest Android OS (Android Jellybean for the GT10 and Android ICS for both thebGT9 and GT8) for prime access to over 100,000 free applications in Google Playstore. Created for the ultra-practical user, the 4-inch GT6 Astroid Jack on the other hand flaunts a 1GHz single core processor, 256 MB RAM, 2mp rear camera (VGA rear camera) and Android Gingerbread OS – all essentials for a decent smartphone experience. 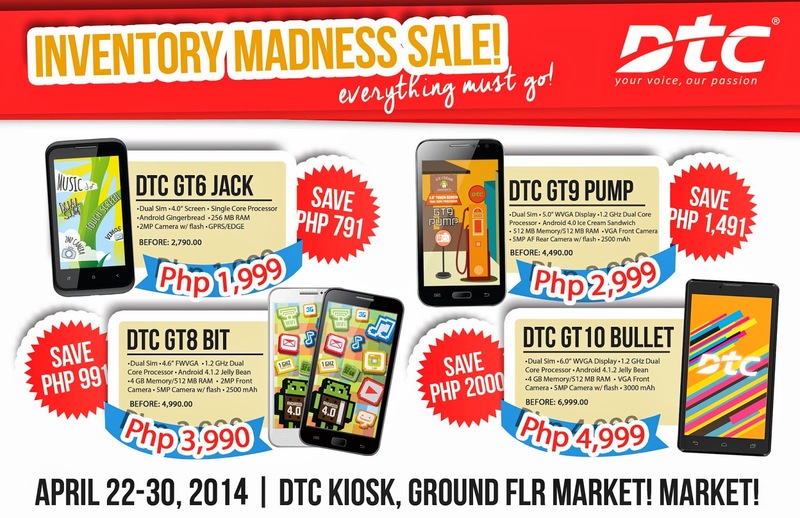 Originally priced at P2,790, the GT6 will be available for only P1,999 during the DTC inventory sale. “As a company, one of our main goals is to bring technology closer to economy mobile users worldwide. And what better way to accomplish that than do a summer sale? With the introduction of our 5th wave units and our upcoming 6th wave phones, we would like our customers to enjoy great discounts on our fourth wave units as they go on their last legs,” said DTC’s Retail Business Operations Head Marta Buensalida. To know more about DTC and their products, visit their website at www.dtcmobile.com.ph.